We compare the numerical results with the solution given by the multipole expansion of Sangani and Acrivos, 1982. This is Table 1 of Sangani and Acrivos, 1982, where the first column is the volume fraction Φ of the cylinders and the second column is the non-dimensional drag force per unit length of cylinder F/(μU) with μ the dynamic vicosity and U the average fluid velocity. We will vary the maximum level of refinement, nc is the index of the case in the table above, the radius of the cylinder will be computed using the volume fraction Φ. The domain is the periodic unit square, centered on the origin. We do the 9 cases computed by Sangani & Acrivos. The radius is computed from the volume fraction. We output the non-dimensional force per unit length on the cylinder F/(μU), together with the corresponding value from Sangani & Acrivos and the relative error. We dump the simulation and draw the mesh for one of the cases. We stop at level 9. The non-dimensional drag force per unit length closely matches the results of Sangani & Acrivos. For Φ=0.75 and level 8 there is only about 6 grid points in the width of the gap between cylinders. This can be further quantified by plotting the relative error. It seems that at low volume fractions, the error is independent from the mesh refinement. This may be due to other sources of errors, such as the splitting error in the projection scheme. This needs to be explored further. The adaptive mesh for 9 levels of refinement illustrates the automatic refinement of the narrow gap between cylinders. 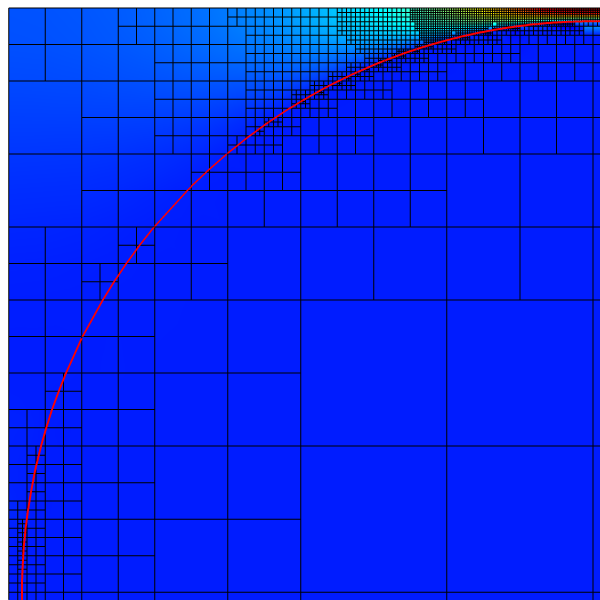 Adaptive mesh at level 9 for Φ=0.75. AS Sangani and A Acrivos. Slow flow past periodic arrays of cylinders with application to heat transfer. International Journal of Multiphase Flow, 8(3):193-206, 1982.